This article is about a book and accompanying TV series. For the movie based on the book, see The Men Who Stare at Goats (film). 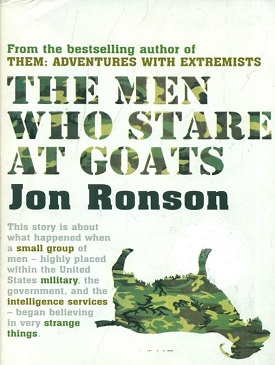 The Men Who Stare at Goats (2004) is a non-fiction work by Jon Ronson concerning the U.S. Army's exploration of New Age concepts and the potential military applications of the paranormal. The title refers to attempts to kill goats by staring at them and stopping their hearts. The book is companion to a three-part TV series broadcast in Britain on Channel 4—Crazy Rulers of the World (2004)—the first episode of which is also entitled "The Men Who Stare at Goats". The same title was used a third time for a loose feature film adaptation in 2009. The book's first five chapters examine the efforts of a handful of U.S. Army officers in the late 1970s and early 1980s to exploit paranormal phenomena, New Age philosophy, and elements of the human potential movement to enhance U.S. military intelligence-gathering capabilities as well as overall operational effectiveness. These include the First Earth Battalion Operations Manual (1979) and a "psychic spy unit" established by Army Intelligence at Fort Meade, Maryland, in the late 1970s. (This was the Stargate Project, which the book never mentions by name.) Ronson is put on the historical trail of the "men who stare at goats"—Special Forces soldiers who supposedly experimented with psychic powers against de-bleated goats at Fort Bragg, North Carolina, at the now-decommissioned "Goat Lab" medical training facility. He examines, and dispenses with, several candidates for the legendary "master sergeant" (Chapter 2) who was reported to have killed a goat simply by staring at it, in the earliest days of the program. A martial arts instructor named Guy Savelli claims to be the one. In the middle third of the book (Chapters 6-11), the author leaps to the present day—i.e., 2004, just after the Abu Ghraib abuse revelations—and attempts to make connections between the earlier (now terminated, and mostly discredited) military programs and the abuses resulting from the post-9/11 War on Terror (Abu Ghraib, Guantanamo Bay, psyops in Iraq, etc.). This includes the use of the children's song "Barney & Friends" on Iraqi prisoners-of-war. A purported linking element is the alleged use of music and subliminal messaging at the 1993 Waco siege and other FBI operations. Another is the private business "franchises" and consultancies that retired members of the "psychic unit" later pursued as civilians. A connection is also proposed between these "privatized" psychics and the mass-suicide of members of the Heaven's Gate cult in 1997. The final section of the book (Chapters 13-16) leaps backward to the 1950s and attempts to connect the Army psychic program, and later interrogation techniques, with the CIA's MK-ULTRA "mind control" research program and the notorious death of Army researcher Frank Olson in 1953. Ronson spends time with Olson's son Eric as he attempts to uncover the mystery of his father's death. The reason his father was terminated, as we discover, was not simply because he knew too much but, rather, that he was having a crisis of conscience and seriously entertaining the notion of going public with all that he knew. The narrative ends with the suggestion that the "psychic warriors" are now back in business working for the U.S. military again, possibly in support of assassinations. Glenn B. Wheaton, retired U.S. Army Special Forces sergeant with 5th SFG; psychic and remote viewer; set Ronson on the trail of the "men who stare at goats"
James V. Hardt, research psychologist and expert on the electrophysiological basis of spiritual states; assisted the "men who stare at goats"
Edward ("Ed") A. Dames, retired Army major, intelligence officer and psychic; frequent guest on the Art Bell radio show; known as "Dr Doom"
Lyn Buchanan, retired Army intelligence NCO and psychic; unlike several of his colleagues, did not go on to develop a civilian "psychic franchise"
Frank Burns, retired Army colonel and Internet pioneer; purportedly coined (with Channon) the Army's '80s recruiting slogan "Be All That You Can Be"
Ronson's book was met with mostly positive, often glowing, reviews: the Boston Globe opined that it is "a hilarious and unsettling book.... Ronson comes off as an unusual cross between Comedy Central's Jon Stewart and The New Yorker's Seymour Hersh." The New York Times' Janet Maslin stated that "Ronson sets up his book perfectly. It moves with wry, precise agility from crackpot to crackpot in its search for the essence of this early New Age creativity....". Some critics, however, were skeptical of what they considered Ronson's shaky logic and some of his bolder assertions. Alex Heard's review in U-T San Diego was subtitled "Goats tries hard to link psychic-spy projects from the past to today's events, and mostly fails". In many instances, he wrote, "...there isn't a link. Instead there's a progression of occurrences that don't connect in a meaningful way. The result is a strange new blend: Conspiracy theory meets Six Degrees of Kevin Bacon.... You're left feeling like you've been told a shaggy-goat story." Part 1: "The Men Who Stare at Goats"
Part 3: "The Psychic Footsoldiers"
It was broadcast in Britain on Channel 4. A fictionalized feature film version of the book was released in 2009 under the same name. Grant Heslov directed from a script by Peter Straughan. It is set in Iraq, but was filmed in Comerío Street, Bayamón, Puerto Rico and at the New Mexico Military Institute. The story centers on "Bob Wilton" (Ewan McGregor)—the Ronson stand-in—a desperate reporter who stumbles upon the story of a lifetime. He meets "Lyn Cassady" (George Clooney)—a composite character—who claims to be a former secret U.S. military psychic soldier re-activated post-9/11. Jeff Bridges plays "Bill Django"—clearly a version of Jim Channon—the founder of the psychic soldier program and Lyn's mentor. Kevin Spacey plays "Larry Hooper"—a wholly fictional character—who is a former psychic soldier now running a rogue PsyOps unit in Iraq. The film is prefaced with a title card stating "More of this is true than you would believe". The DVD release of The Men Who Stare at Goats includes a bonus documentary featuring Ronson and many of the people who feature prominently in his book. Coinciding with the release of the feature film in 2009, John Sergeant, the producer of the TV series Crazy Rulers of the World, accused Ronson of "airbrushing him out of the story". While Ronson dedicated his book to Sergeant and included an afterword commending his research and guidance, the feature film did not mention his contributions. ^ Krippner, Stanley and Harris L. Friedman (2010), Debating Psychic Experience: Human Potential Or Human Illusion?, Santa Barbara, CA: Praeger/Greenwood Publishing Group, pg 154: “The story of Stargate was recently featured in a film based on the book The Men Who Stare at Goats, by British investigative journalist Jon Ronson (2004)”. ^ Geoff Boucher (November 1, 2009). "Jeff Bridges, psychic warrior". LA Times. ^ "These are The Men Who Stare at Goats". ComingSoon.net. September 12, 2008. Retrieved 2010-03-29. ^ Sergeant, John (2009-12-01). "How My Involvement with The Men Who Stare at Goats Was Erased Entirely". Huffingtonpost.com. Retrieved 2010-03-29. ^ Akbar, Arifa (2009-11-03). "Clooney caught in crossfire as war breaks out over latest film – News, Films". London: The Independent. Retrieved 2010-03-29. "Book Discussion on The Men Who Stare at Goats". C-SPAN. 14 April 2005. Retrieved 2 May 2015.